Pep Guardiola is waiting to discover the severity of Riyad Mahrez’s ankle injury after the Manchester City attacker hobbled off against Bayern Munich. 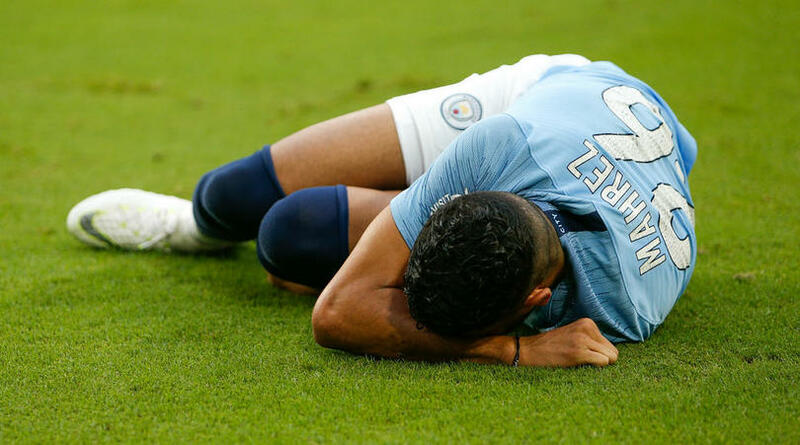 Club-record signing Mahrez was substituted in the 28th minute due to ankle problem in City’s 3-2 win over Bayern at the International Champions Cup on Saturday. Mahrez, who arrived from Leicester City in a £60-million deal, went down early under a challenge and the Algeria star failed to shake off the problem before the half-hour mark in Miami. ‘I don’t know [the extent]. I wasn’t in the locker room,’ Guardiola told reporters. ‘It was his ankle. We will see, maybe it is not a problem. After capping their United States tour with victory having tasted back-to-back losses, Guardiola said: ‘We analysed our mistakes from the previous games and we played a lot better today. We started really well and had a lot of chances. We kept going and I am satisfied.